Tastour is excited to announce a new ‘work hard-play hard combo.’ It’s a 3 hour hike and a 2 hour vineyard tour and tasting via train from Victoria. The best part is at the end of the day, you will be able to look at the hill you’ve climbed from the vineyard! A delightful walk taking in woodland, rolling downs, the River Mole and of course Box Hill itself where there are some stunning views to be had from Salomons Memorial as far as Devils Dyke by the South Coast. 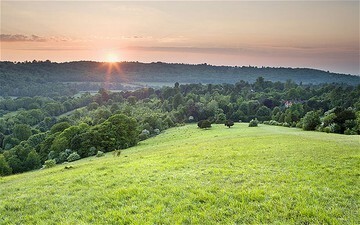 Box Hill is located on the North Downs and lies within the Surrey Hills area of Outstanding Natural Beauty as well as being part of the Mole Gap to Reigate Escarpment Site of Special Scientific Interest and has inspired poets like Keats and writers like G.K. Chesterton. As well as it’s natural beauty, Box Hill also plays host to a more recent fort built in the 1890s to help defend England from a possible French invasion and a semi derelict folly from 1815. We shall be passing by the route for the 2012 Olympics cycling race this summer – at the steepest point, considered to be the best for viewing due toe the speed of the riders and also the steep banks to watch from with 15,000 spectators expected here! Please note: This walk does have some strong climbs and requires a good level of fitness and as it can be slippery strong and appropriate footwear too. Denbies is the largest vineyard in England. 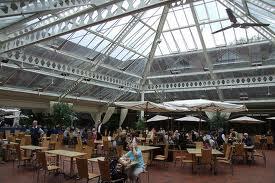 It’s won many awards and features on high-end restaurant list such as Claridges. It’s like Disney Land here. 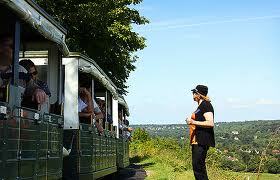 The train ride around the vineyard is magical and will be a well deserved rest after the hike. We are bringing a bring and share picnic lunch for the walk. However there will be time to have a coffee or light bite inside the Cafe at Denbies before the tour. There is an upmarket village pub very close to the train station. We will stop in for drinks and nibbles before catching the 8pm train. Please note: The tickets are only valid on this train, so you need to be on time please. We’ll meet at 9:10 am where you can grab a coffee. We’ll leave the meeting spot at 9:20 prompt for the 9:31 train. We’ll stop during the walk for a snack lunch so please bring food and drink to share. There will be time for a coffee and light bite before the vineyard tour. After the tour you are welcome to join us at the pub near Box Hill after the walk. The walk is 9 miles and has some hills in it. Hike level: 6/10 Please ensure you’re happy keeping up a reasonable pace over this distance. The walk should take 3.5 hours, however we are allowing 4. No hiking experience is required, however, if the thought of walking from Westminster/South Bank Centre to Tower Bridge scares you, then it’s probably not the best walk to start with. £42.00, if booked by 1st September. £45 if booked after. We are likely to encounter mud in places on this walk and there are some steep climbs that can be slippery. Sensible footwear – ideally hiking boots! This entry was posted in Events on 25 July, 2012 by adminfw.